Overall, the episodes in this 14th boxed set of the long-running animated series pale in comparison to the heyday of its first eight-or-so seasons. But, at the same time, there’s still a lot to love here, and I defy you to name ANY series that still manages to have this many consistent moments. That’s sort of a trick question, since most TV shows don’t even make it to 14 seasons (in fact, as of this writing, “The Simpsons” is now the longest running series of all time). “The Simpsons” has reached the point where comparison to other shows is pointless and redundant; one can now only assess each season by comparing it to previous ones. That being said, there isn’t a single episode that compares favorably to those made several years earlier, yet at least half of them are funnier and more original than any current “Family Guy” episode. Which raises the question…should the longtime “Simpsons” fan invest in this set? For completists, the answer is obviously yes. For fans who only wish to relive the greatest moments of the show overall, the answer is probably no; in my humble opinion, the show’s best years were seasons three through eight, and season 14 falls into that netherworld where the show itself seemed to have exhausted most of its original ideas. But to the newbie who has never experienced the show? Hey, there might be two or three of those left, and for them, there are a lot worse ways to spend your cash. Starting with the annual “Treehouse of Horror” episode, there are a lot of laughs to be found in the episodes here, many of which warrant repeated viewings. “The Simpsons” may no longer be considered the cutting edge of TV comedy but it is still one of the more consistently entertaining programs. 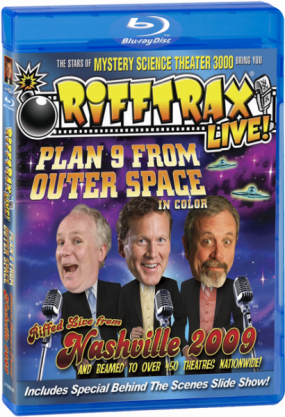 This 14th boxed set doesn’t not feature the show at its best, but it is still a decent collection of sharp and humorous satire. 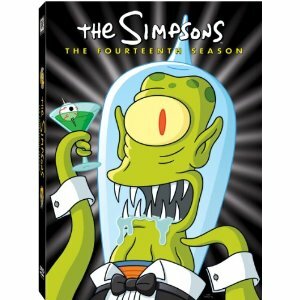 The Blu-ray set features two exclusive episodes (Treehouse Of Horrors V and VI). Two decidedly minor 70’s-era films on James Coburn’s extensive resume are now available on a single disc from Shout Factory. Personally, I always thought Coburn was a far more effective supporting actor than a leading man, having been part of the of the greatest action films of the 60s in that capacity (The Great Escape, The Magnificent Seven). He’s also been allowed to shine in a few quirky leading roles (the spoofy & campy Flint series). Over the years, he developed sort-of a tough guy persona, though he was never in the same league as the Waynes, Eastwoods or McQueens. He’s been in a lot of great films, but he also appeared in a lot of crap. 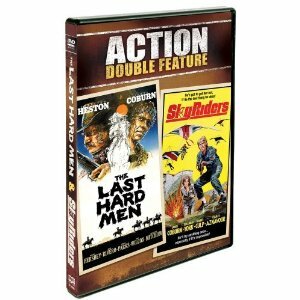 The two films in this collection, The Last Hard Men and Sky Riders, fall into the latter category. The Last Hard Men plays like a Wild Bunch wannabe. In this, Charleton Heston plays a retired lawman forced back into service when his long-time nemesis (Coburn), escapes from prison and vows revenge by kidnapping his daughter. But what made The Wild Bunch great was the theme that progress was leaving the film’s outlaws behind. The Last Hard Men briefly touches on those ideas before focusing more going ‘squib happy’ in depicting gunshot wounds. Coburn is the best part of the film, engaging in some fun scenery-chewing, but the story itself is unpleasant and often really boring. Sky Riders is more entertaining, though it’s the type of 70’s-era movie that most people probably saw as the second half of a double-bill. In this one, Coburn is recruited to perform a rescue from one of the old standard impenetrable fortress, since time leading a team of hang-gliders onto a mountain top. It’s kind of fun, but is definitely a product of its time and instantly forgettable, and hasn’t aged all that well. This disc is recommended for Coburn completists only, and not those who seek his greatest films. To see the man at his best (or most amusing), you’d be better off with such better films as The Great Escape, The Magnificent Seven, Affliction, Charade, Hell is for Heroes or one of the Flint films.